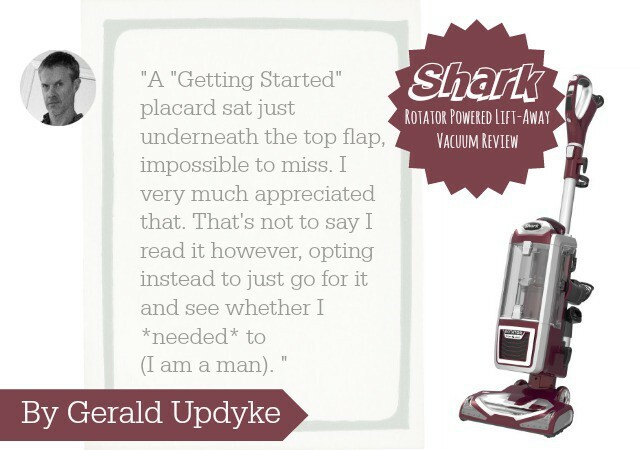 I am so excited to share today’s review about the Shark Rotator Powered Lift-Away vacuum, mainly because I didn’t write it! The truth is, I am not terribly great at keeping the floors clean. Life happens and kids are messy. Not to mention, keeping the floors clean requires actually cleaning the floors, ahem. 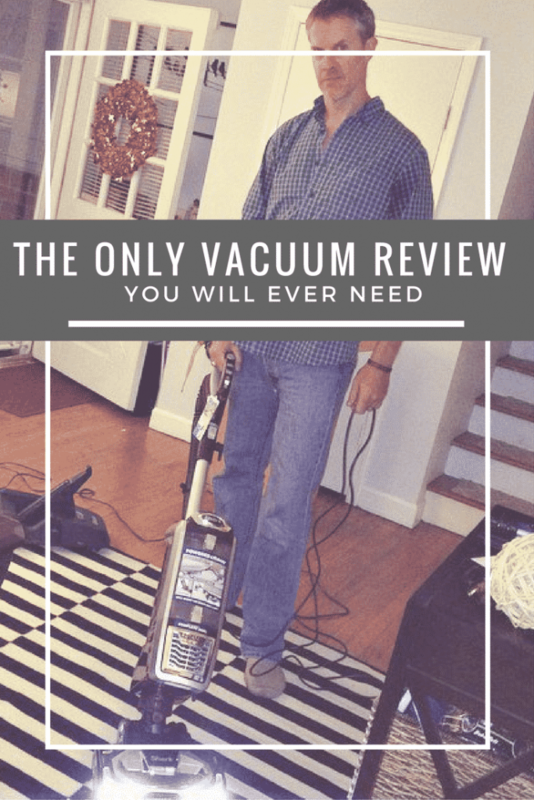 However, my husband is an absolute whiz with the vacuum, so when we got the Shark Rotator Powered Lift-Away vacuum to review, he immediately claimed it! In fact, he liked it so much, he even offered to write the review! I don’t think I need to tell you how much I am winning here. Please welcome my husband, Gerald Updyke! The Shark Vacuum Cleaner arrived out of the blue one day. I had no idea what it was at first or why we had received it. I unboxed it and asked Andrea a question I never thought I’d hear myself asking: “Did you buy a new vacuum without telling me? ?” She explained the how’s and why’s of its presence, at which point I pulled it out and got to work. The Shark was intelligently packaged and undamaged as a result. A “Getting Started” placard sat just underneath the top flap, impossible to miss. I very much appreciated that. That’s not to say I read it, however, opting instead to just go for it and see whether I *needed* to (I am a man). Turns out I didn’t and assembly was very easy, a credit to the intuitive design. The look of The Shark is a combination of Modern and Retro: sharp, neat lines and a shiny chrome (plastic) grill. I love it. The main canister of The Shark snaps onto the cleaning wand for use as a traditional upright. Using it this way would be handy for quick jobs, but detaching makes it lighter and more maneuverable. It comes with a caddy on which you can snap the canister, but I found myself carrying the canister via the top handle with my left hand, using my right hand to push. The hose connecting the two is plenty long, which my long arms do not take for granted. The wand is removable at either the sweeper unit (near the floor) or up closer to the handle for use with the multiple attachments. My favorites are the powered brush, which is perfect for stairs or upholstery, and the long bristly wand for baseboards and walls/corners. While the bristle wand is pretty standard, the powered brush adds huge value. The On/Off button is located at the top of the shaft handle for easy access with the thumb, as is the selector switch. You can choose between smooth surfaces, medium, and thick carpet. Our house requires all three! Check out the official list of features below. As nice as The Shark looked, I’m all about performance: if it didn’t perform well, I was prepared to write about that. Not an issue: the Shark lived up to and exceeded my high expectations. The Shark is a powerful vacuum. Seeing all the dust and dirt in the canister was an eye-opener, for sure. Our house is very dusty which, while not *visible* on carpet, wreaks havoc on my allergies. I can tell you the dust is VERY visible in the canister, though, which brings me to a huge plus for The Shark: bagless vacuums don’t stink like bag vacuums because you can empty them as often as you want. Our last vacuum had a bag and once it got about half full, the smell it spread around the house while using it was reason enough not to use it. Emptying the bag before it was full seemed like a waste of money, so that put us in a no win situation. Bagless is definitely the way to go. Another plus for bagless: we have kids who love Legos. Vacuuming up tiny Lego pieces with a bag vacuum means that piece is gone forever. With The Shark, I can hear pieces get sucked up, keep on going and when it’s convenient for me, get in there and retrieve it with relatively little effort. The same goes for jewelry, money, etc. The Shark is extremely maneuverable thanks to a swiveling head. Tight angles around obstacles are easily achievable, and getting underneath couches and tables is no longer a problem thanks to a slim profile and the ability to lower the shaft to 180 degrees (parallel with the floor). Nice! Most vacuums I’ve ever used are OK in open space, but lack the ability to clean right up against walls: there’s an inch or two of floorspace along the perimeter that never gets cleaned! No longer an issue, as The Shark cuts this space down significantly. The vacuum head is wide and the brushes extend almost all the way to the edge. The Shark has strategically placed lights that shine in all the right places. I found this most useful when using the wand attachment, as it really lit up the baseboards and corners. Dirt is no longer safe in our home, people. 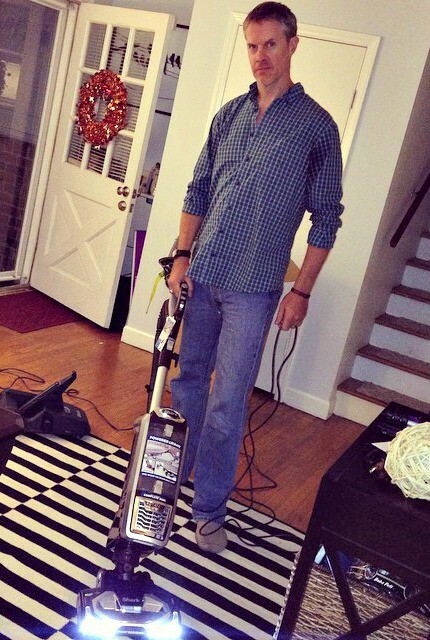 If you want your house to stink and have dirty floors, continue using your antiquated bag vacuum. 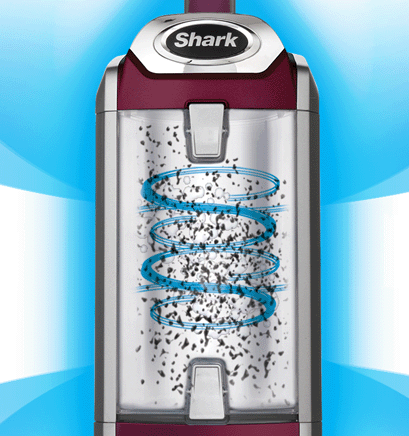 If you want your house to smell good, have cleaner floors than ever before and never sneeze again, check out The Shark. It’s the real deal. Check out their website for a complete list of features and buy one. We received the above product at no cost for the purpose of this review. All opinions and conclusions are original and sincere. Thanks for reading! Joy has risen. Hope has come. Good review. I think I’ll give one a shot. You have shared a best review. I have known so many things from this article. I want a shark vauum.